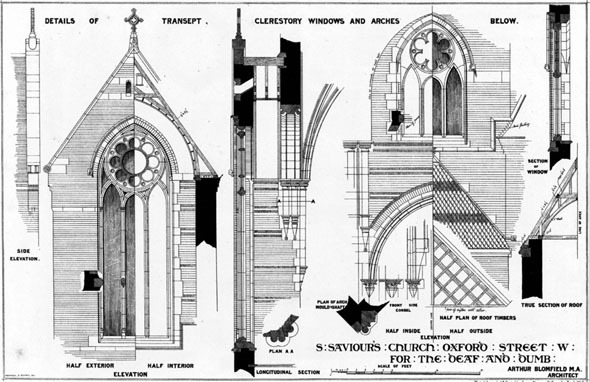 In June 1875 a church named St. Saviours was opened on a site in Oxford Street that had been leased to the Association for The Deaf & Dumb by the Duke of Westminster for a term of sixty years at the nominal rent of ten shillings per annum. The founding stone was laid by Edward, Prince of Wales and Princess Alexandra who was known to have a hearing impairment. The site was due to expire in 1931 but it was agreed to surrender the site in 1922. The site of the church eventually became the Selfridge’s store. Published in The Building News, December 18th 1874. 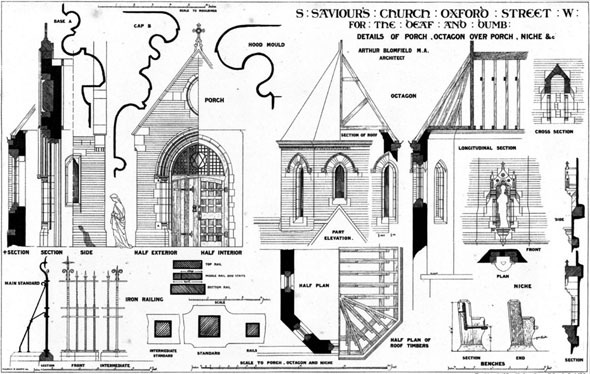 “We are enabled to give this week perspective view and tour sheets of details of St. Saviour’s Church, Oxford-street. The building consists of a lecture-hall below, and a church above. The entrances are in Queen-street. The site is given by the Manquis of Westminstcr. The shape of the site and the peculiar requirements of its future occupants led to a somewhat unusual plan. 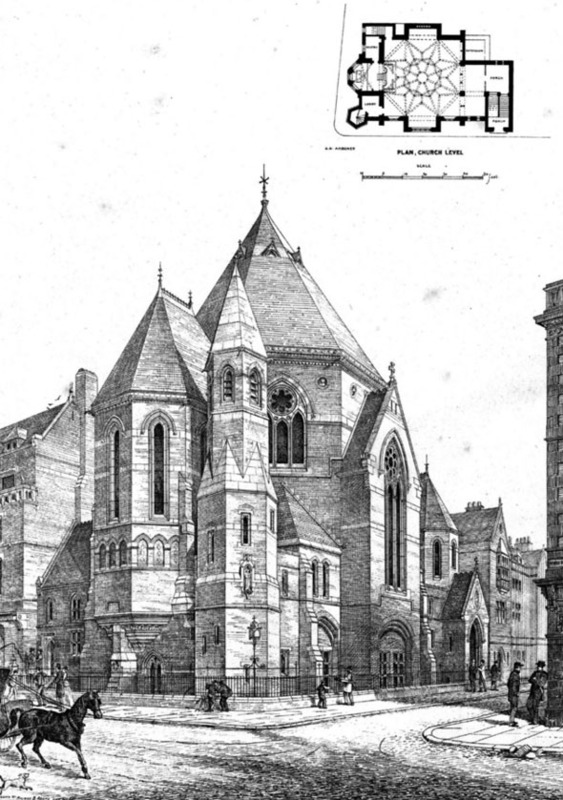 The absolute necessity of an uninterrupted view of the chaplain, and the absence of all the usual accessories of organ, choir, &c., seemed to suggest an arrangement somewhat like that of a theatre. 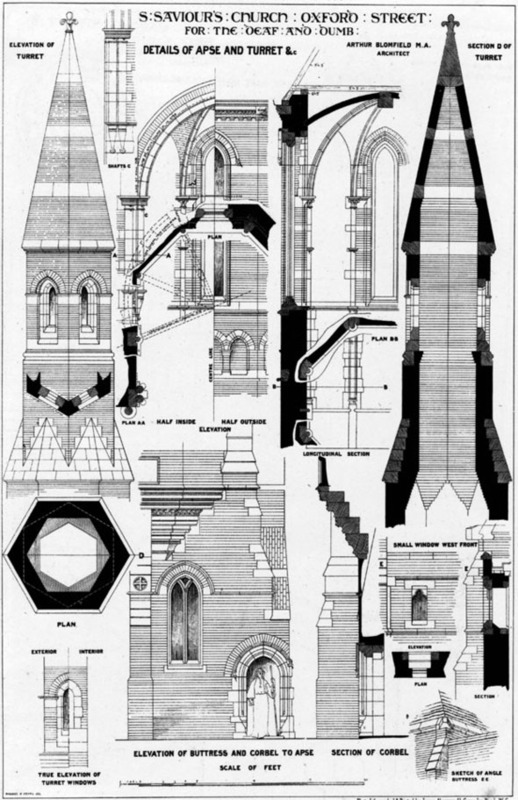 This, however, would have been entirely wanting in anything like ecclesiastical character, and would, moreover, have rendered it impossible to light the lower floor suffciently. 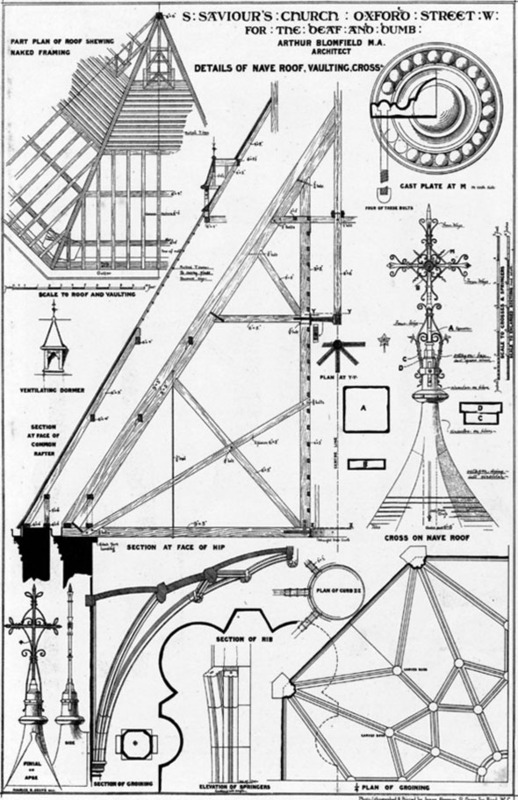 The plan was therefore adopted as one which, while meeting all the requirements of the case in a utilitarian point of view, is not without precedent as a form for a church. and is capable of effective and picturesque treatment.